SEE A FEW VIDEOS AT BOTTOM. Also “I can’t breathe” protest song. Many more from around country on PPA FB and PPA FB Event. See “Resources” drop down. / Statement on the shooting of police in Brooklyn (also pdf). Espanol. / National Stolen Lives: Three-part Power Point (women), two-part all: Click here. See Resources for placards/slogans/chants. 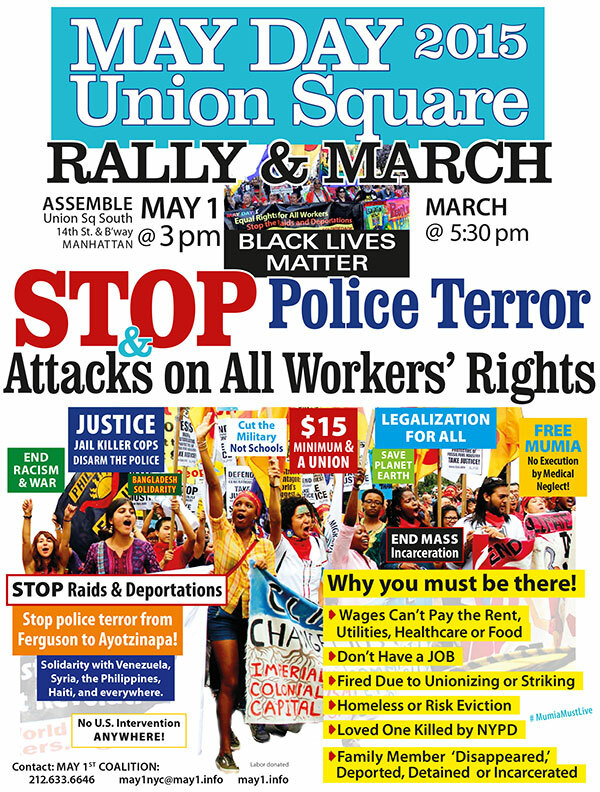 -April-May, 2015: Urgent April 25: Mumia Health Deteriorates: Mumia Monday Call-in / Analysis: Connecting the LWW & BLM movements / Police use new tactic to divide BLM movement / Report from April 2 Peoples Tribunal on Police Violence & Structural Racism, Youtube. **MAY 2015: STAND WITH BALTIMORE: WHAT YOU CAN DO NOW! Click here. -Plan Now: Sat, June 6, 2016; 2-7pm. 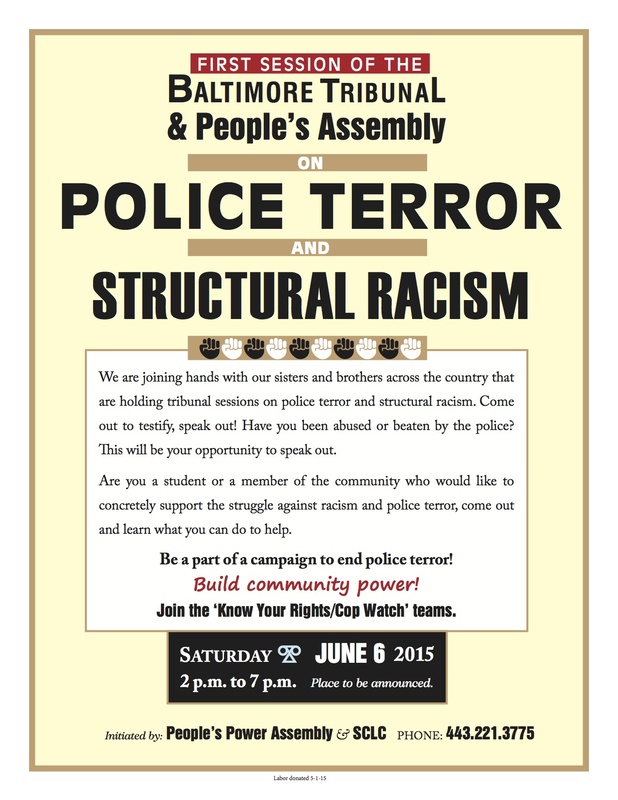 Baltimore Tribunal & Peoples Power Assembly. 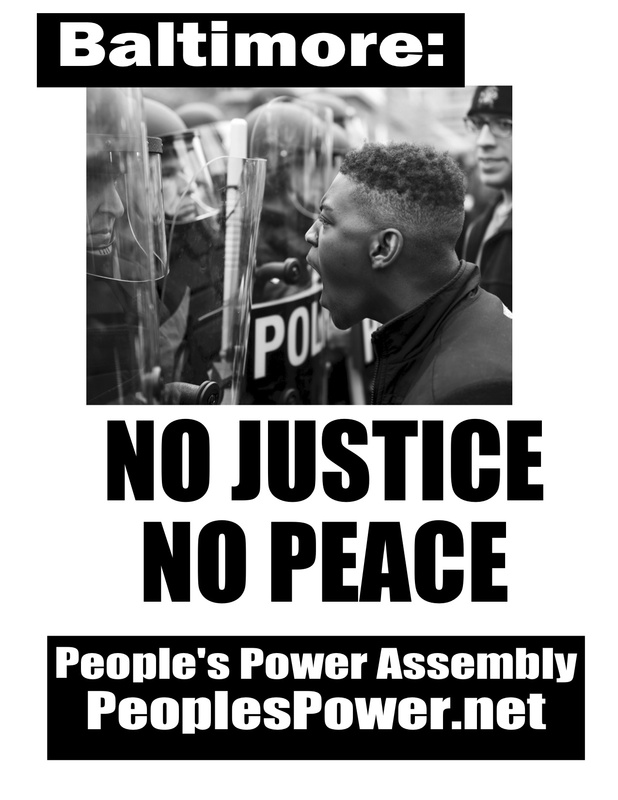 ***May 1, 2015: STAND WITH THE BALTIMORE REBELLION – Emergency Appeal from Baltimore PPA: Take Action NOW to Demand Amnesty for arrestees, Justice for Freddie Grey. Stop demonizing our Black working-class youth! To Donate, get Background, click here. <<<See Resources for 3 placards>>> Also Rally Sat May 2 1pm. ***National Day of Action: SHUT IT DOWN FOR FREDDIE GREY ON MAY DAY: THE CALL; FB Event; Ferguson Response Network. SEE BELOW. Click here for a nationwide listing. See esp. 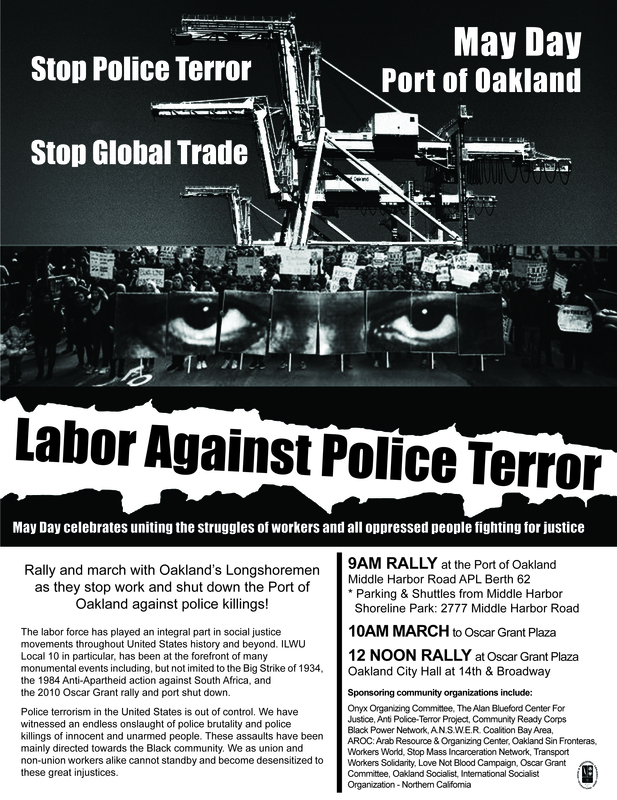 Port of Oakland May Day SHUTDOWN to call attention to Stop Police Terror. 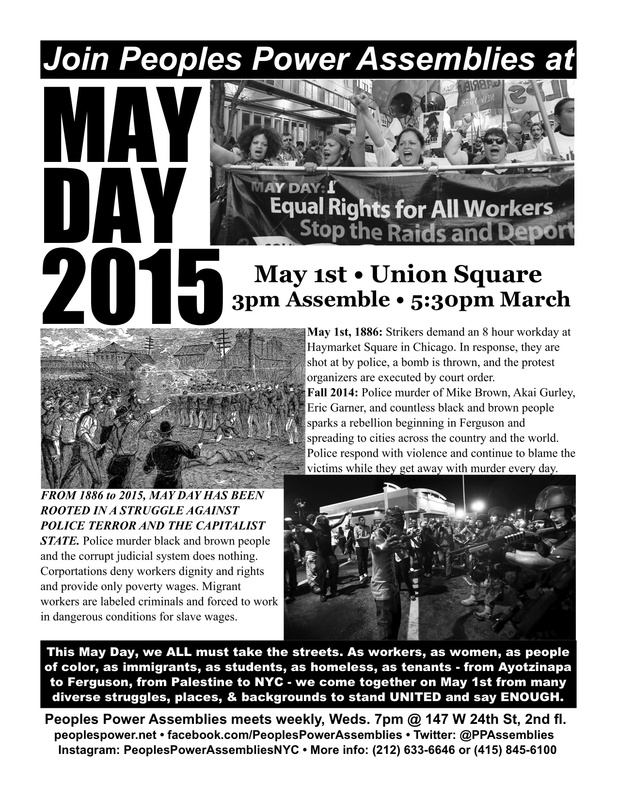 See also MAY DAY SHUT IT DOWN FOR FREDDIE GREY FB Event & also Ferguson Response Network. Click image to enlarge. ****FLASH: Baltimore: Justice 4 Freddie Grey Citywide Protest – No Business as Usual! Saturday, April 25, 2015. FB Event. To Donate, get Background, click here. -3) For Round-up of militant, inspiring actions from around the country, see PPA FB & PPA FB Event. -4) For listings of future actions from around the country: FergusonActionNetwork, FergusonAction/actions, NYC, Balt .